Bike Lanes are a Public Health Priority!! Last week, the local paper in my community ran an article about the candidates in my riding who are running in the provincial election. Apparently, one of them is saying that all roads should provide three feet of space between bikes and cars, while another is calling that position impractical. I found myself thinking, whether I agreed with the specific policy or not, it was about time that bike lanes became an election issue! In 2010, I had the opportunity to interview over 60 public health professionals working in ten public health units across this province about the ways in which they were working to change the built environment in order to improve human health. There was one position that staff from all ten public health units agreed upon. Whether they were working to improve air quality, increase physical activity, address climate change, reduce the rates of chronic disease, improve mental health, or foster a sense of community, public health professionals from all ten public health units agreed that our communities must be created, or re-designed, to support active forms of transportation such as walking and cycling. From Sudbury to Niagara Falls and Haliburton to Owen Sound, the public health professionals all agreed that we need to get people out of their cars! They all agreed that we need to ensure that our communities allow people to get around safety, efficiently and conveniently without needing to use their cars! Active transportation can improve air quality. In 2008, the Ontario Medical Association estimated that poor air quality in Ontario contributes to approximately 9,500 premature deaths each year. Most of those deaths are from chronic heart and lung diseases that result from long-term exposures to unhealthy levels of air pollution. The transportation sector in Ontario is well-recognized as a signficant source of air pollution. Many studies directed at high volume traffic corridors have demonstrated that highways can have a significant impact on local air quality and on the health of those who live near them. One study, conducted by Toronto Public Health and Health Canada, demonstrated that, each year, 190 premature deaths from traffic-related air pollution in Toronto, could be avoided if vehicle-related emissions were reduced by 30% by shifting people to alternate modes of transportation. Active transportation increases the levels of physical activity among residents. Agencies such as the Public Health Agency of Canada have concluded that a moderate increase in physical activity can reduce the risk of chronic diseases such as Type 2 diabetes, colon cancer and breast cancer by as much as 50 per cent. They estimate that billions of dollars in health-related costs could be saved if levels of physical activity were increased among the overall population. A variety of studies have demonstrated that people who live in communities that support walking and cycling can get the physical activity needed to stay healthy by doing errands and walking to local services. There are a number of factors that determine whether people will walk or cycle as a means of transportation; the provision and design of walking and cycling facilities such as sidewalks and bike lanes are among those factors. Studies have demonstrated that many people will not cycle if it does not feel safe. One study of bicycle-friendly environments in the Netherlands, Denmark and Germany found that the safety of the cycling facilities in these countries was the most important factor contributing to the higher levels of cycling in those countries, particularly among women, children and the elderly. While there is considerable debate how best to design cycling facilities, and there is a recognition that the facilities needed will vary depending upon the speed and volume of traffic along a particular roadway, the debate about whether cycling facilities are needed should really be over. This entry was posted in Active & Sustainable Transportation, Healthy Communities/Sustainable Communities and tagged active transportation, air quality, Built environment, Climate change, cycling and health benefits, cycling and health risks, public health and Land use planning by Kim Perrotta - Executive Director (Volunteer), Creating Health and Sustainable Environments. Bookmark the permalink. All of this is fine and dandi folks. But, until you change the underlying systems and mindset of the people good luck!I got hit on April 24th on Preston and sommerset. I was going straight on Preston south bound. The driver going north and turning left on sommerset. As I approached the intersection (about 25m or so), I perform a visual on the driver. The light turns green around this time. Next thing I know the driver is turning in front of me! I clip the back end. The driver yells out you cut me off . Five other people yell you cut off the cyclists . The driver never gets a ticket because he claims he was in the intersection first. The driver claims to be x-ottawa cop. He leaves a voice message on my answering machine stating he is too busy to cover the costs of my bike until May 18th. He also states in there that I was travelling at a good clip . Proof that he did see me and that he knew I was moving (speed limit is 50km/h in this area try to do that on a bike!). He took the chance and cut in front of me.But, because the police did not give a ticket. I have to prove fault to his insurance. Not an easy task!! !Then I noticed someone else got hit from behind on the monday on sussex (where someone was killed Sept 2009). The driver did not get a ticket.Something very very strange is going on with the police not issueing tickets. Maybe against cyclists?Then I noticed a report on trirudy.com where one cyclist went up to the gatineaus this weekend and got harrassed by police.What is going on here!!! !We need a change in mindset and in our system.Denmark is a very expensive city to drive in. It has major deterents. 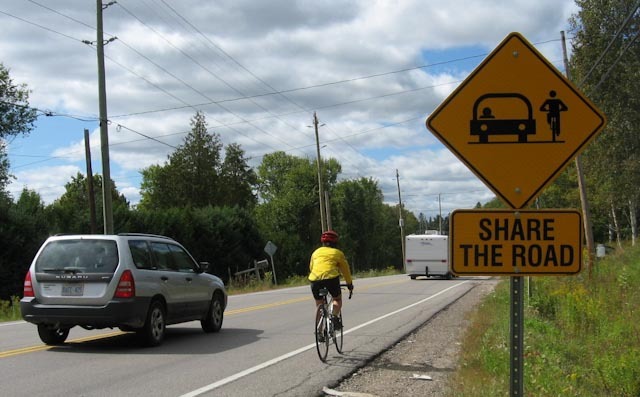 Hence, cycling is made easy while driving difficult.In Canada, driving is seen as a right. Heck, you can pretty much run someone over and get away with murder!!! Our system(s) is stuck in the 1950s!! !